What is in the Mariana’s Trench? All questions for the ages that have no definitive answer. Many speculate and offer their own thoughts. But, few can come to a common ground. From an extremely outside perspective, I believe players should be compensated in some form. 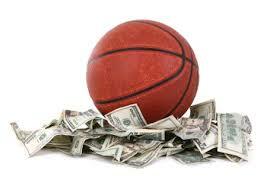 After all, football and basketball programs generate millions in revenue for top tier schools. However, University signed paychecks fall into an extremely gray area, even if legalized by the NCAA. 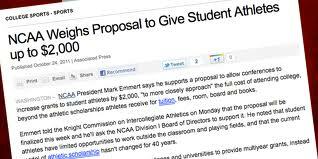 My proposal: why not let student athletes make their own money? An athlete should be compensated for use of their likeness by outside sources. If some memorabilia store right down the street from school is plastering Geno Smith’s face on their shirts, why shouldn’t he see any money for that? Players should be allowed to copyright and profit from certain saying or images while still in school. “Fear the Brow,” “Tebowing,” any of those forays into pop culture should be met with monetary reward for the player. As long as it doesn’t interfere with university activities, student athletes should be permitted to appear at events for money. Why shouldn’t a sports bar be allowed to pay Johnny Manziel for an all day signing event? I understand that schools want to protect their players. They are young people with little experience in a professional business world. Many will try and take advantage of them. But, if the NCAA is unwilling to pay college athletes, than the players should be permitted to seek out a profit from sources unaffiliated and unrelated to the universities they attend. It seems simpler to compensate athletes in a manner not involved with the NCAA. This would remove the burden of regulation from the NCAA’s shoulders, allowing the free market to dictate what a student athlete can possibly make. I don’t believe the system as currently constructed can continue for much longer. As revenues grow and player’s brands expand, it will be nearly impossible to get through a season without an illogical rule infraction. So, why not dissolve the problem completely and allow college athletes to try and make their own money?